Usually I don't write any tutorial where the target process is not freely available, but recently I found a game which is small enough, somewhat popular amongst kids and most importantly, it is a fine example to show basic encryptions. This tutorial will cover info about basic encryptions, checking values in the stack and backtracing some functions in the program. The game that I will use is Chicken Invaders 4, but this tutorial contains generic information that can be used in other programs too. Alright, the first step is to aquire the target process, Chicken Invaders 4 v4.00. This is the program and the exact version that I will use for the demonstration. If You have installed the game, play with it a bit to get familiar what kind of game is this. A simple space shooter against evil chickens. Ridiculously stupid concept but the game itself (regarding the programming, graphics and music) is not a bad job. Now change the game to run in window mode (not in fullscreen). In this whole tutorial, we will try to change the amount of lives. If You have tried to search for it, You have probably failed miserably. The reason of this failure: the game is using encrypted values to store the lives, points, food, missiles and keys. What You need to do is set the value type to Byte and search for changed/unchanged values when You die. NOTE: You can search for food or points too if it is easier for You. You will find these same codes. bit is 1. You can use calc.exe to calculate XOR. For more information, use Google. Teaching Boole-algebra is not part of this tutorial. If You have understood what is the purpose of this instruction, You realize that the value You are searching for is combined together from 2 values. By looking at the codes, it is obvious what are these values. One of them is stored on [ecx+0104] and the other value is stored on [ecx+0080]. Using the debugger to find out what addresses accessed by these codes, You can find the key values for the lives. Very good, now set both values to 0, and You should have 0 lives. Awesome, now the only problem is that You have 0 lives on the screen but in reality, You have the same amount of lives as originally. Which means that all You have found and changed was the displayed value and You did not change the real amount of lives. This code is running frequently, READING a few values. Obviously, it is not reading the number of lives only, but some other stuff too. This code however is used only when a value is changing. This is the code which is WRITING to our value. Let us take a look at it. We can see that ESI register is used to hold some important information and hey, it is using xor on some address, [esp+10]. Just out of curiousity, let us take a look what is stored on [ESP+10]. Start a new game, and You will have 5 lives. Now You have 2 choices to check this value. 1. Right-click on the code and use "Break and trace". 2. Press F5 to set a manual breakpoint. If You have set a manual breakpoint, the game is now freezed and You can see the value of ESP, 0012EB10. ESP+10 is 0012EB20 and if You add this address to Your table, You can see that the value on this address is 4. Press F5 again to remove the breakpoint and press F9 to enable the program to run. If You have done this, You can see that the value on Your address is changed immediately. Very good, we had 5 lives, we have died and ESP+10 shows 4. If You die again, it will show 3. It is clearly holding a DECRYPTED value for our lives. NOTE: More experienced users will know that we can use conditional breakpoints to work with harder codes, but it is easy to work with this one so we will use this. The stack is a "storage" where You can put values and load them from it. However You are not able to save and load the values in any order. The last value in the stack that You push in will be the first one that You pop out. For example lets assume ecx=3, edx=2 and the stack stores the following values. Now we put an instruction like "push ecx". Then the stack will look like this. Now we also put in edx with "push edx". The stack will look like this. Now we want to pop a value from the stack, like "pop ecx". and put it to ecx. So ecx=2 and the stack look like this. The result: The stack is the same as when we have started, but ecx=2 now, and edx=3, we have changed their values with each other. Alright, now You know how are values pushed in and pulled out from the stack. It is not a random process, it is working in strict order. The next thing You need to learn about a bit is the stack pointer and how it is used. In my example, I will use a totally unreal sized stack which holds 16 bytes only. The stack pointer: The stack pointer is showing the top of the stack, which is in our case the ------------------ line. The stack pointer is the ESP register. In our example 0012FEFC is the top of the stack, and this can be figured out by checking the value of ESP, which is 0012FEFC. Now let's push something in the stack. We have pushed a value in the stack and the top of the stack has been decreased with 4 bytes again. Now ESP = 0012FEF8 and the value on 0012FEF8 is 8. Let us push another value again, let's say 5. Now as You see, the top of the stack has been (again) decreased with 4 bytes. ESP = 0012FEF4 and the value on 0012FEF4 = 5. So what happens if we need to know the value on 0012FEFC for example? This is very simple, let me add an extra coloumn to our example to show ESP. As You can see from the example, the value on 0012FEFC is [ESP+08]. This instruction will copy 5 to EAX register and the top of the stack will move again. I hope this example has clearly shown what is the purpose of the stack pointer (ESP) and how is the stack used to store information. If it is not clear, it may help if You trace any kind of code and examine how is the stack working in that code. Now back to our original mission and as now You are familiar with the stack, it is time to examine our code again. If You make a script to change [ESP+10] to 99, You will notice that You will really have 99 lives. And You will also have 99 points, 99 food, and 99 missiles. This is because the code is used to work with other values too, not just with the lives. So what now? We can't use this code to make an unlimited lives cheat. It should be clear by now that ESP+10 is an address in the stack. This means that the real number of lives are stored somewhere, then it is decrypted, moved into the stack and used by the function that we have found. Our task is to find the code which is moving the value into the stack. is used to change the lives, ESP+10 = 0012EB20. What we need to do is find the code which will copy the number of lives to 0012EB20. Though this is a temporary storage only, I guess You have realized that we could just write a script to change 0012EB20 when this code is running, but we will not do that because it would be lame. We will do it the right way and we will find the code which is putting the value in the stack to see where it is stored. What we need to do now is a little backtracing. You can see that the Break and trace option is capable of tracing the running code from some point. But how do we go "back in time" to see where did the code came from? 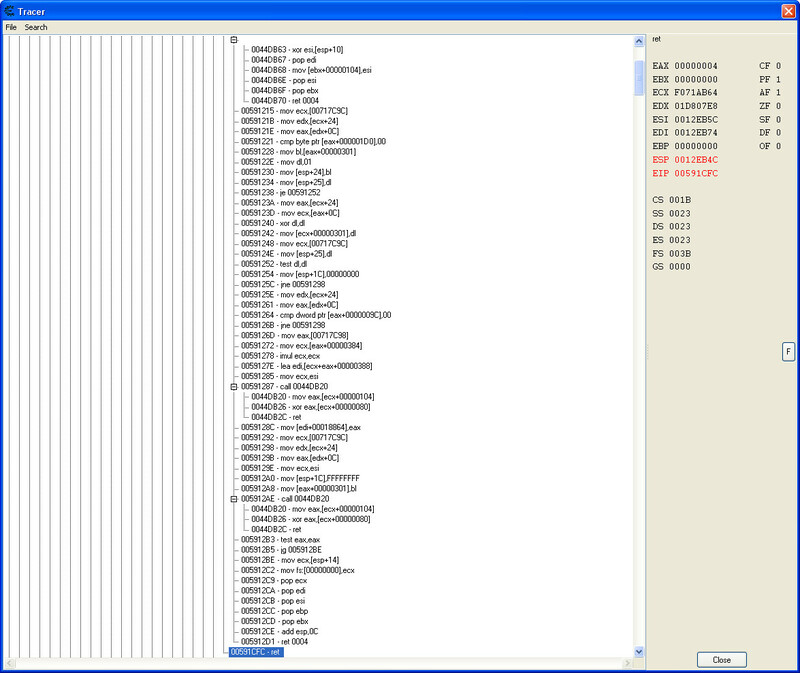 Yeah, I see You are thinking "we will just scroll up in the disassembler view", but it is not that simple. You have to learn a bit about functions. A program is full of functions. The purpose of the function is to execute some task, than return to the point where it was called. In our case, the code we have found is part of a function to encrypt/decrypt values and it is called from many places to do this task. After it is done, it will return to the place where it was called and the program will go on. Of course some tasks are so big that it can be breaked down to smaller tasks. If You think about it this way, You realize that a function can have many sub-functions, those sub-functions can also have sub-functions etc to break down the whole process to small bits and pieces. So how is it working? So why is this important? Let's assume that our code is working like this. We want to find the code "put the number of lives in the stack". For this, we need to find where is "call 1", then trace from there and find the code. We start from a tiny sub-function, and we need to go "backwards". How can we do this? By following the return points. Don't forget, if You know where is the program returning to, You will know where the function was called. And as the ret instructions are AFTER our code, we can trace them and see where the program is jumping, so we will have not just the return points, but the entry point of the functions too. I hope it is clear so let's start. First, add 0012EB20 to Your table as we will look for an instruction where 0012EB20 is changed to the number of our lives. 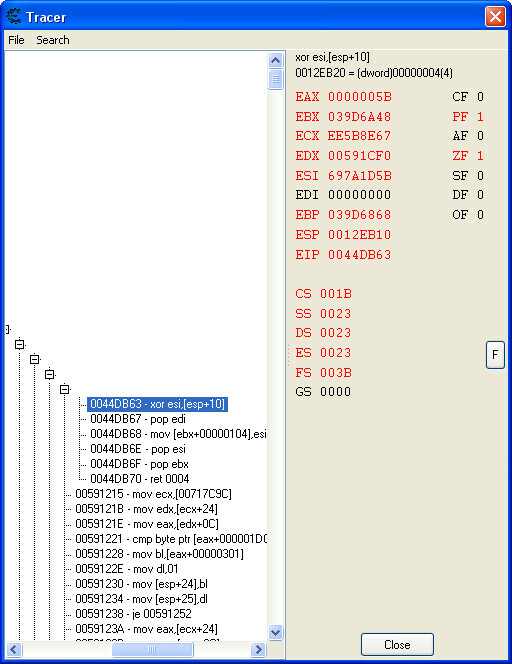 Then start a game, right click on the "xor esi,[esp+10]" and use Break and trace. All You have to do now is die once. Your trace should be ready. 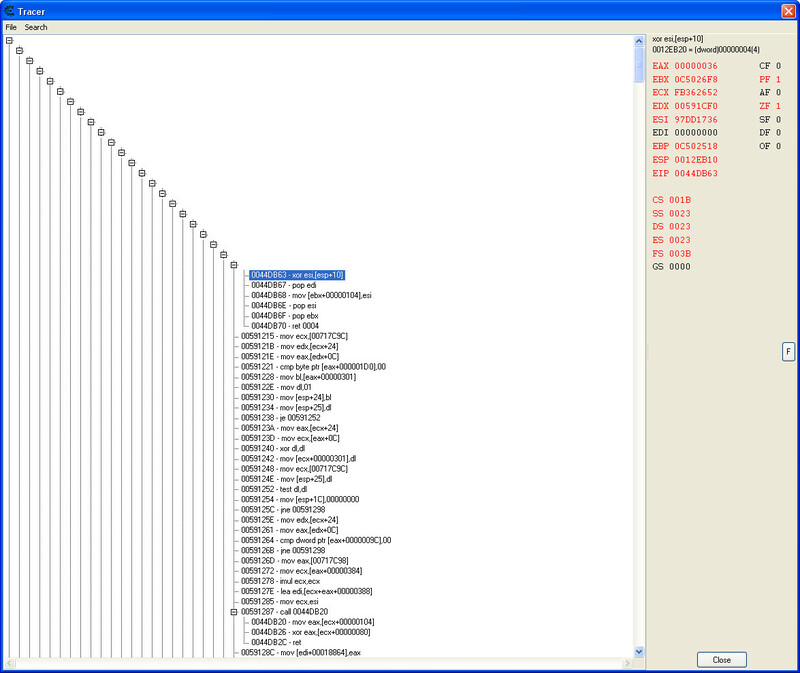 Right-click in the trace window and choose "Expand all". NOTE: Return addresses are stored in the stack but as CE 6 has a very nice tree view which shows the return points, we don't have to bother too much to find them. This is why the new trace window is one of my favorite options. So our function was called from here. Let's set a breakpoint on this call. Click on it and press F5. Now loose a life. The program is now stopped. Look at our address in the table, 0012EB20. It is already holding the number of our lives, so it was copied there before this function. We need to go back further. Press F5 on the code again, and press F9 to enable the program to run. Look at our trace and find the ret instruction which will bring us back with one level. As You scroll down, You will see a few sub-functions, only a few lines of codes, but we don't need them, we want to go back with a level so find the place where the tree will go back with a level. Set a breakpoint on this call again and die in the game. Ok, the game is stopped. Look at 0012EB20. It has a value which is definitely not the number of remaining lives. This means that the code which will put the value on this address is not executed yet. Now we step in the code very slowly and see what happens with the value on 0012EB20. Press F5 to remove the breakpoint and then press F7. Now You have stepped one line in the code and You are at 005911D0, where the function is starting. Step again and again and again. And after every step, look at 0012EB20 in Your table to see if it was changed. From these few lines, it is clear that eax is copied from [esp+24], from the stack and then it was put at the top of it. Ok, save these codes and press F9 to let that miserable program to run already. We still don't know where is the value stored in the memory, but we have a code which is working with this value and we can change it here. As a final test, put a breakpoint on this code and play the game to see that this code is used only when You loose or get a life. Well I can tell You this function is not used for anything else, so You can use code injection to change EAX or [ESP+24] at this point. NOTE: Experienced users may consider setting a data breakpoint with Break on Write on address 0012EB20. This way they don't need to use single stepping and the debugger will stop the program right after "push eax" is executed and the value on 0012EB20 is changed. Congrats, You have made Your "Unlimited Lives" cheat for Chicken Invaders 4 and hopefully You have learned new things that will help You to cheat in other games. Of course there are other ways to create this cheat too, but this way I could put many info into one tutorial, using one game only.